Take $300 per person off on board the Ocean Adventurer or World Explorer and contact us for further discounts with this Cruise Company. 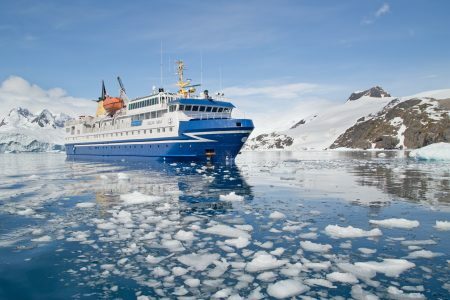 You’re ready to explore King George Island and the Antarctic Peninsula—and no Drake Passage crossings are required! With a spectacular aerial view, including charter flights between Punta Arenas and Antarctica have you experiencing the majesty of the 7th continent before transferring you to your ship in no time. Day 2 Flight from Punta Arenas to King George Island, Embarkation day. Day 7 Disembarkation and flight from King George Islanda to Punta Arenas. Return to King George Island and bid farewell to Antarctica before boarding the flight back to Punta Arenas. Upon arrival, transfer to your hotel for the night. Note: Meals in Punta Arenas are at your leisure and not included in the program. For Air-Cruises starting in Punta Arenas,group transfers airport/hotel on Day 1. Transfers airport/hotel on the Day of the Scheduled Return Flight from Antarctica, and transfers hotel/airport on last Day of the Air- Cruise Program. voyage. Specifically, dinner in Punta Arenas upon return from Antarctica is not included. 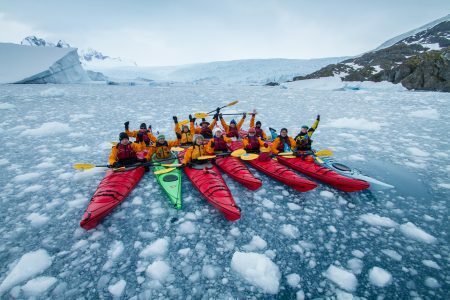 Experience Antarctica from the unique vantage point of a sea kayak. The majestic landscape, the icebergs, the wildlife… everything looks different as you paddle quietly through the waves. A unique experience! The sea kayaking program offered, is a group experience limited to a maximum of 10 participants, under the guidance and leadership of an experienced Kayak Master. Every day you are in Antarctica, your Kayak Master will work with the Expedition Team to look for the best kayaking opportunities within the trip’s schedule, based on suitable and safe weather conditions. The group will be supported by a dedicated safety Zodiac. Each kayaking excursion will be approximately one and a half hours in duration. At the end of the excursion the Kayak Master will strive to offer the group some time at the landing site so you can explore. The per-person participation price is $895 USD. Gain greater mobility and see more of the Antarctic landscape with our hiking and snowshoeing program. Excursion locations are selected for their scenic appeal and will provide unique vantage points for your photographs. Depending on the conditions of the terrain, some excursions may require the use of snowshoes and/or trekking poles. The hiking and snowshoeing program is a group experience limited to a maximum of 12 participants led by a Mountain Guide. 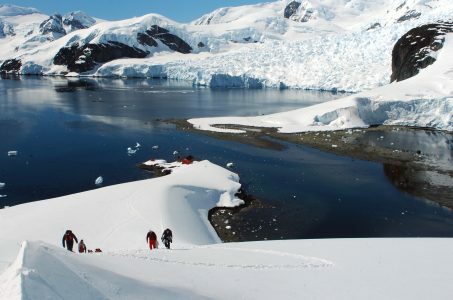 Every day you are in Antarctica your Mountain Guide will work with the Expedition Leader to look for the best hiking or snowshoeing opportunities within the trip’s schedule, based on suitable and safe weather conditions. Each excursion will be approximately one and a half hours in duration. To take part in the hiking and snowshoeing program you do not need previous experience. However, your level of physical fitness should be good. The minimum age for participation is 12 years. The per-person participation price is $195 USD.